Striker Aaron Connolly will make his return for Brighton & Hove Albion U23s when they face Vancouver Whitecaps this evening. The 19-year-old, who signed on loan for Luton on transfer deadline day, has been out of action since January 14, after suffering a hamstring injury against Liverpool U23s. Ahead of the game, at the American Express Elite Football Performance Centre, which kicks off at 7pm, Connolly tweeted: "Buzzing to be back involved tonight after the injury." 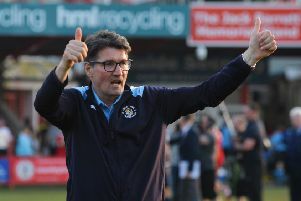 Speaking about his plans the Albion attacker involved at Kenilworth Road, Town chief Mick Harford said earlier this month: "Obviously he will need some match time, so hopefully Brighton will get him some match time in one of their U23 games.